When a band sets off in a new sonic direction, sometimes what comes out in the end can come across like bad karaoke. Everything sounds a bit off, like they are struggling to make the songs their own. But for the few bands that can pull off a dramatic shift in sound, the audience eventually comes around and gets into it. Six Organs of Admittance tried something different on their latest album, Ascent, and recently brought this new sound to the Casa del Popolo Nov. 29. Despite the shifting roster, guitarist Ben Chasny has remained at the forefront of Six Organs of Admittance since their inception in the late 90s. The band has produced some of the best acoustic drone-rock around, but earlier this year fans were introduced to a new electric guitar-based sound that was heavier than previous albums. But this shift in sound is neither surprising nor new. For Ascent Chasny teamed up with Comets on Fire, something he wanted to do for years. In 2008 Comets on Fire went on hiatus, so the new Six Organs of Admittance album is a welcomed reunion. Before starting the set, Chasny joked that he brought his acoustic guitar, but decided to instead play electric, since the opening band’s set was acoustic-based. “There can’t be two acoustic guitars,” Chasny said. From the onset it was clear that if you were expecting to hear the mellow acoustic songs from Shelter from the Ash, or Asleep on the Floodplain, you were in for a surprise. 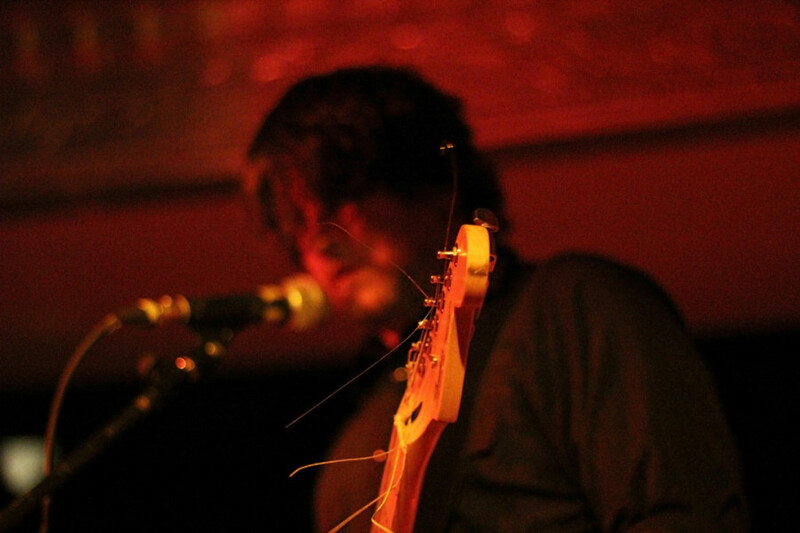 With very few breaks, Six Organs of Admittance ripped through several songs, taking the audience on a long, hypnotic trip more suited to a desert spirit journey than Casa del Popolo. The highlight of the set was the track “Closer to the Sky,” which eventually dissolved into a louder version of Lou Reed’s “Vicious”. Chasny quietly sang the lyrics, making them almost unrecognizable, but the steady bass-riff, and rambling guitar solos gave away the cover. The opener was a brand new project of Arcade Fire’s Richard Parry. It was their first performance, a point brought up throughout the set as Parry joked that people shouldn’t hesitate to ask questions, or provide feedback. The three-piece played stripped down acoustic songs that incorporated beautiful vocal-harmonies and subtle electronics, which give them an other-worldly feel. While all the songs were quite good, one of the better songs was unnamed, but had a backstory. “That song was about a boy whose parents fell asleep on the beach, so he eventually turned into a fish,” Parry said.